It all began when Madame Alexander and her sisters began making cloth dolls. Once their business out grew their homes, Madame and her husband, Phillip Behrman, started manufacturing dolls in New York City in 1923. Through the years, the Alexander Company made exquisite composition and cloth dolls. In 1948, they started making them out of hard plastic. 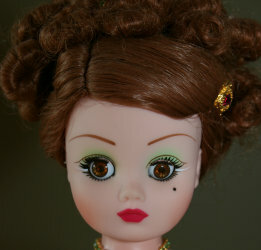 By the 1950's, the dolls were highly sought after. My mother Alma, loved collecting various kinds of dolls, and these beautiful Madame Alexander Dolls were part of her collection. In rememberce of her, I thought it was perfect to showcase these pretty girls on my site along side my Barbies! Click the links above to see the various collections.